High in the mountains of planet Earth, an ocean of the purest, most pristine air in the world fills ancient valleys and laps against weathered peaks. It is in this primordial environment that the freshest herbs, most nutritious berries, tastiest fruits and healthful plants grow wild and free. At that high elevation, far away from human industry and pollution, oxygen is at its peak and the air itself is a life giving nectar that allows both flora and fauna to thrive. Here, oxygen and other vital nutrients help heal and rejuvenate the fruits, herbs, plants animals and all of humanity. A visit here — to savor the sunshine or to harvest organic wildcrafted herbs — is a spiritual experience. Like breath of cool mountain air, BerryBreeze™ oxygenates, cleans and re-invigorates the fruits, vegetables and food that you store at home in your refrigerator, extending both their life and their freshness while preserving their nutritional benefits. BerryBreeze™ extend the life and longevity of your food, and that in turn could help extend your life and longevity. BerryBreeze™ keeps your fruits, veggies and other food in your fridge from spoiling and decay (2 to 3 times longer), while maintaining freshness and nutritional value. BerryBreeze™ sanitizes your fridge by safely and naturally neutralizing microorganisms, germs, mold, yeast, fungus, bacteria and viruses. 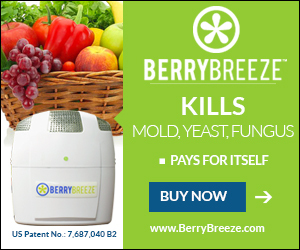 BerryBreeze™ completely eliminates all unwanted odors and tastes from you refrigerator and your fresh food. BerryBreeze™ can help eliminate pollution. Americans waste over 33 million tons of food per years, which is the largest component of U.S. municipal waste and a large portion of methane emissions. BerryBreeze™ helps save the planet and reduce your carbon footprint for a greener planet by reducing plastic containers, bags, and wraps. BerryBreeze™ is easy to use and maintenance-free. We use a superior Patented Technology that produces activated oxygen versus aluminosilicate (absorption packs).